Improved email deliverability translates into a higher return on your investment. More emails delivered means more email messages opened! More messages opened means more people will see - and click on - your products, services and offers. For example, let’s just say that you were to improve your deliverability - and consequently your inbox delivery - by just 25%, what would that look like in your business? 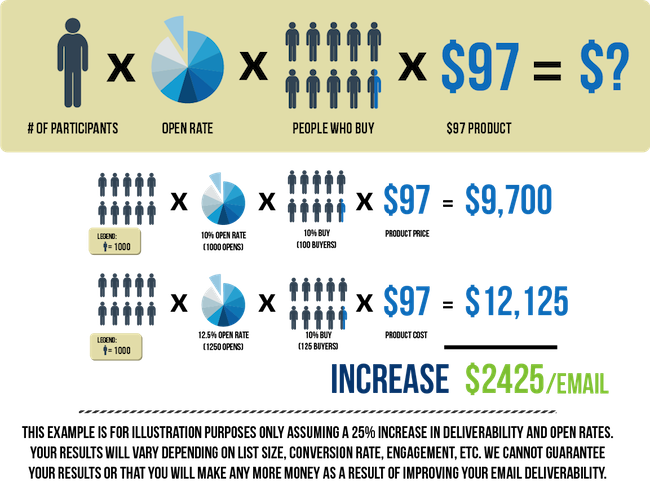 Look at the illustration* below to get an idea of improved email deliverability can impact you. The numbers below are assuming a subscriber base of 10,000 people with a single $97 product promotion. Use this illustration to calculate what improved deliverability could mean for you in your business. * We do not guarantee that you will improve your deliverability by 25%. We have had some clients improve deliverability by more than that and others have seen little increase in deliverability due to circumstances outside of our control. To learn more about how Email Delivered can help improve your email deliverability rates, click here.